The Human Right Focus (HURIFO), an organization that advocates for the protection and promotion of human rights has called on President Yoweri Museveni to take a tough stance on top Uganda People Defense Force officers who used guards to violate civilian’s rights in Uganda particularly in Amuru and Nwoya districts. HURIFO executive director Francis Odongyoo made the appeal on Wednesday during press briefing in Gulu town, saying that the achievement registered by the current regime in human rights protection and promotion is being negated by callous illegal acts of some UPDF soldiers who torture and terrorise citizens whom they are supposed to protect. Odongyoo cited an incident that happened on the March 21 where UPDF soldiers from a detach at Maj Gen Charles Otema Awany’s farm attacked 66-year-old Karim Akwonga of Obiya East Village in Latoro parish Nwoya District at 3:00am, shooting inside his house randomly before setting Akwonga’s house ablaze. The alleged torture victim was a former town clerk of Paidha town council in Zombo District. “Mr Karim [Akwonga] refused to open the door because the soldiers didn’t identify themselves and neither did they state why they wanted him out at such a time. The soldiers reportedly fired live bullets into the house but no one came out. The soldiers then set the house ablaze probably to burn Karim’s body but he was alive and only opened the door after his mosquito net caught fire burning his head,” Odongyoo noted. He added that that Akwonga taken to an army detach at Maj Gen Otema’s farm where he was tortured and later rushed to Nwoya District Police Station and left for dead. Odongyoo said according to Nwoya District police, the assailants (UPDF soldiers) charged Karim with criminal trespass. Ms Anne Aceng, the human right protection officer at HURIFO, said 10-15 cases of human rights violations are reported involving soldiers against civilians from Amuru and Nwoya district on a monthly basis. Ms Aceng said police fear to handle cases of rights violations especially when they involve powerful officials who are the suspects. “They should stop using soldiers for the few rich to hurt the poor,” she said. 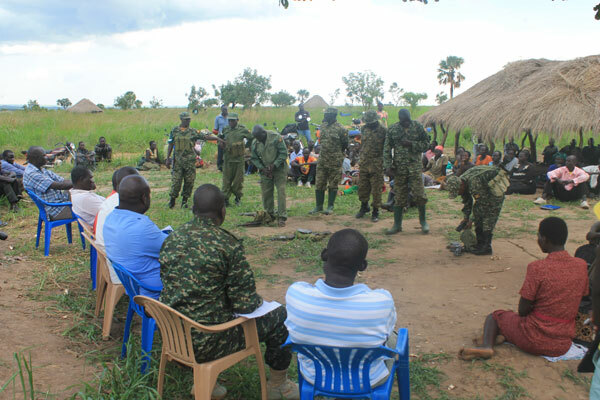 Godfrey Oryem Binaisa, Research and Advocacy officer of HURIFO noted that in the similar practice of human right violation by soldiers, two community primary schools in Amuru district in the area of Karatye and Leb Ngec village have been taken over by UPDF soldiers purportedly guarding land belonging to their bosses. He said such has led to no access to education by children in those communities. He said HURIFO is also following a case where one child went missing since June last year after a soldier shot live bullets in the air to scare away residents. He says in the process of people scampering, the child got lost and up to date a missing person case is being investigated by police. When PML Daily contacted the 4th Infantry Division Spokesperson, Maj Telesphor Turyamumanya, he said the case is a land conflict which is a private matter concerning Gen. Otema and he is not in position to comment. “The case is a on the private property of Gen. Otema. I cannot comment on his privacy,” Maj Turyamumanya said. Jimmy Patrick Okema, the Aswa police spokesperson confirmed that the case was registered at Nwoya Central Police Staion and Akwonga is receiving treatment at Anaka Hospital as investigation to ascertain whether Akwonga burnt himself or not continue. “We are yet to investigate whether he set fire on himself or not,” Okema said. In October last year, the Lady Justice Catherine Bamugemereire-led Commission of inquiries into land matters, after investigating conflicts in Acholi sub-region, recommended that the use of government soldiers to protect private farms fuels conflicts in the area.